Surprise surprise. I am here. This is the region in which I will be spending the next two months or more. I was always under the impression that I would be closer to Lake Geneva. But I took another look at the map, and Anzere, the place where I will be located with Village Camps, is here in the Valais region of Switzerland. But I am getting ahead of myself. On the way to Saint Leonard, I met a snake. Being from New Zealand, the country with no snakes or any other nasty creatures that could bite you and poison you to death, I fearlessly poked it with a stick till it was tired enough for me to capture this shot. It didn’t look poisonous. I wasn’t game enough to touch it, but it looked friendly enough. Brown in colour, and about 20cm long, with a 1cm or so thickness. I mistoook it for a very large worm at first. 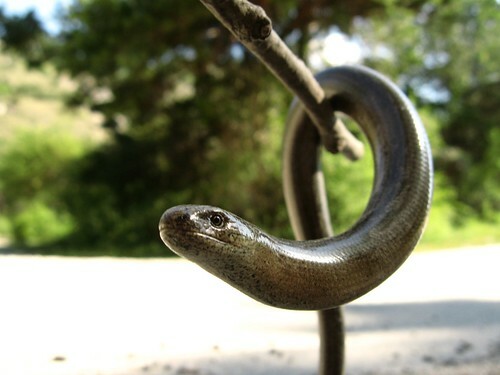 After asking locals about it, it appears that this is a harmless garden snake. And speaking of locals, I met Lukas today. 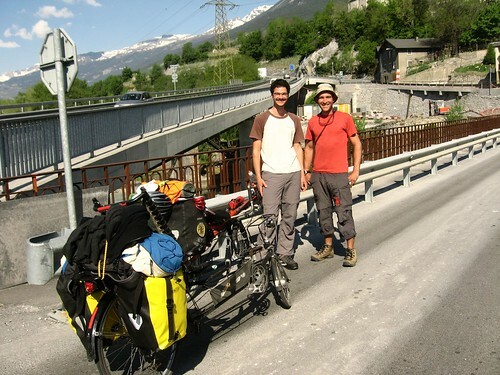 He is from up north in Switzerland, and rides a Swiss-made recumbent. The maker is FATEBA, and it is a long wheelbase recumbent. He was on his way up a hill to climb some mountains. cool all those names of the places sound familiar (I spent a long time in Switzerland over many visits, I will be travelling with a Swiss this August too). I am not sure where it is located but you can perhaps contact DT Swiss – the manufacturer of the spokes and rear shock of your bike (they make awesome hubs too but your bike got Shimano instead) and tell them the spokes and rear shock have been serving you wonderfully and you haven't had troubles so far. Your post on the broken indexing ring made me realise that how durable modern bike parts are – the continuous abuse in the heat, dust, sub-zero temperature and vibration. It really pays to get better-quality bike (and parts). There is a good reason why Suntour still makes beautiful barend/downtube shifters which are NOT indexed. Some professional racers prefer non-indexed downtube shifter (even Lance Armstrong used a bike with one downtube shifter and another STI). I think for the front derailleur non-indexed ones are still better. You have enough time now to practise Swiss-German and French. Did you get your passport stamped at the border? Satoshi, I told the border guard that I needed a stamp, and explained to him that I would be working in Switzerland. But he went inside his wee booth and came out 5 minutes later and said that I didn't need one. Just get one from the police once you get your work authorisation, is what he said. I hope he was right. Looks wonderful by the way. You should enjoy the camp and then be all fired up to finish off the adventure. Have fun. I am off to Madison tomorrow for the first time in three years. Hopefully two weeks to relax and forget all about translating Toyota related nonsense. Finally seems like spring around here too. Take care. Jürgen, you are brilliant. Thank you for clearing that up. I did think that the head of it looked rather skink like. I guess I can play with any further slow worms I may find then. While working out in Darfield I made a skink trap which would probley work if you wanted to catch yourself some slow worms. 1. Take one piece of 25mm PVC pipe (the black stuff) and tape up one end. The skinks like the warm pipe and the feeling of saftey the got from being in a "hole" and will hide in there. All you have to do is pick the pipe up and turn it over gently and the skink (or legless skink) will slide out onto your hand. Lovely countryside. Is it warm there now, hence the short sleeves? I was gone for a couple of days and I see that you already made your way into the Swiss Alps. I am sure that you will have a great time from now in this great country. Although it is sometimes a bit expensive, if you get orientated you'll find places to get your stuff for a low price. And the quality of the food like cheese, joghurt and any other food of this nature is fantastic. And you'll find quickly that this is a unique country, f.e. every man has to keep his military rifle at home, just in case of a sudden outburst of war etc :-), four totally different languages in one country and off course the best cheese in the world.